Received July 10, 2018; Accepted August 7, 2018.; Published online August 29, 2018. Discovery of the naturally evolved fluorescent proteins and their genetically engineered biosensors have enormously contributed to current bioimaging techniques. These reporters to trace dynamic changes of intracellular protein activities have continuously transformed according to the various demands in biological studies. Along with that, light-inducible optogenetic technologies have offered scientists to perturb, control and analyze the function of intracellular machineries in spatiotemporal manner. In this review, we present an overview of the molecular strategies that have been exploited for producing genetically encoded protein reporters and various optogenetic modules. Finally, in particular, we discuss the current efforts for combined use of these reporters and optogenetic modules as a powerful tactic for the control and imaging of signaling events in cells and tissues. Since the first cloning of GFP from the jellyfish Aequorea Victoria (Shimomura et al., 1962), exploitation of the fluorescence proteins have been indispensable in biological studies. Genetically encodable hues allowing direct conjugation in desired biological systems have offered the most benefits of these fluorescent proteins out of many previously developed chemical dyes. This paradigm shift of observational strategies in cell biology have led to the intensive development of GFP spectral variants allowing us to investigate a variety of physicochemical events occurring in living cells and animals (Alford et al., 2012). Accumulative adoption of GFP variants in biological researches have encouraged researchers to improve photo-physical properties fluorescent proteins including folding efficiency, brightness, pH-insensitivity (Ai et al., 2006; Campbell et al., 2002; Heim et al., 1995; Shaner et al., 2004; Tomosugi et al., 2009). In parallel, discovery of red FP (DsRed) and development of near infrared FPs from anthozoa species and bacterial phytochrome largely expanded the palette of FPs that enable simultaneous detection of multiple fluorescence-labeled target signaling events in a broad range of wavelength (Davidson and Campbell, 2009; Shcherbakova and Verkhusha, 2013; Shcherbo et al., 2007). On the other hand, while these recombinant fluorescent fusion proteins originally report protein localization, morphological shapes, arising demands on technologies to address dynamic nature of protein activities led to the invention of dynamic indicators in order to visualize a broad range of intracellular signaling events. Thereby, various real-time visualizing tools that is genetically encoded fluorescent proteins dramatically revolutionized our ability to monitor dynamic nature of physiologically intact cells and animals. Förster resonance energy transfer (FRET) is one of the remarkable techniques that utilizes genetic engineering of fluorescent proteins (Heim and Tsien, 1996; Ibraheem and Campbell, 2010; Miyawaki et al., 1997). FRET, in general, is an energy transfer process occurring when the two fluorophores locate in close proximity to each other, and this process is highly reliable on the proper spectral overlap and distance of donor emission and acceptor excitation. Biosensors based on this FRET principle was initially adopted to monitor intracellular Ca2+ influx in that cyan donor or yellow acceptor fluorescent proteins are fused to a calmodulin (CaM) at its C terminus and the calmodulin (CaM)-binding region of chicken myosin light chain kinase (M13) at its N terminus, respectively. Binding of Ca2+ causes interaction between M13 and CaM domains leading to relocation of the two fluorescent probes in close proximity followed by an immediate energy transfer of donor fluorophore to acceptor fluorophore (Miyawaki et al., 1997). Since then numerous genetically encoded biosensors have been increasingly shared to visualize the dynamics of signaling molecules including phosphoinositide lipids, small GTPases, membrane voltage indicators, protein kinases and many other protein-protein interactions (Aoki et al., 2004; Dimitrov et al., 2007; Fosbrink et al., 2010; Harvey et al., 2008a; Kerppola, 2008; Nishioka et al., 2010; Pertz et al., 2006). These new trends in developing visualizing tools largely contributed to our understanding of the spatiotemporal dynamics of signaling molecules in living cells and tissues because it provides a new approach with distinct advantages over techniques of conventional biochemistry. Apart from visualizing tools, biologists have long shared a mutual concern that how one can dissect the sole function of molecules or cell-types within the complex signaling networks and organ systems, respectively. In general, cells compose multidimensional signaling pathways to make their optimal fate decisions. Conventional biochemical approaches such as chemical treatment, western blotting and gene knock down, although useful, lack the capability of control in space and time to investigate a specific target signaling event. To address these issues, the recently emerged optogenetic technologies open exciting possibilities in that a number of signaling actuators are both temporally and spatially controlled by the light stimulation of specific wavelength. This profound achievement in modulating signaling processes enabled simple on-off system at desired temporal resolution, rapid reversibility, less off-target effects and the ability to dissect complex signaling networks at subcellular resolution in living cells (Bugaj et al., 2013; Crefcoeur et al., 2013; Kennedy et al., 2010; Levskaya et al., 2009; Strickland et al., 2010; Wu et al., 2009; Zhang and Cui, 2015). Furthermore, since the use of genetically encodable light-sensitive proteins can restrict the expression at desired regions of tissues in living organisms, optogenetic approaches established studies of molecular functions in intact tissues of animals such as manipulation of neuronal function in the brain at physiological condition (Berndt et al., 2011; Boyden et al., 2005; Gradinaru et al., 2007; Ishizuka et al., 2006; Li et al., 2005). Nevertheless, despite tremendous advantages devoted by the light-inducible regulation of actuators, the versatile utilization of these tools are lagged by the typical limitations of biosensors for accessing the dynamic information of intracellular signaling events. In this review, we will mainly evaluate the versatile applications of optogenetic modules in various biological systems, accompanied by the perspectives of efforts in engineering their reporters, especially to directly visualize specific target activities under precise control of light-inducible systems in space and time. As most exemplified by FRET biosensors, a number of target activities have been visually analyzed by adopting fluorescent protein based FRET probes allowing for ratiometric measurements. Among many of them, Cameleon, EKAR, JNKAR, AKAR, Raichu and other indicators for Rho GTPases have frequently adopted for targeting ERK, JNK, PKA, Ras and Rho GTPases (Fritz et al., 2013; Kiyokawa et al., 2011; Komatsu et al., 2011). These biosensors based on the principle of Förster resonance energy transfer, although shed new light on the studies of real time dynamics of signaling molecules, often accompany intensive optimization by trial and error in their development processes. In order to improve the optimal performance of FRET-based sensors, developers have concerned mutual criteria that are high signal-to-noise and sensitivity. The sensitivity of most FRET-based sensors typically depends on brightness and dynamic range of donor-acceptor pairs, and therefore, fluorescent proteins for optimal FRET pairs at their characteristic wavelength have been continuously generated through random or rational mutagenesis (Nguyen and Daugherty, 2005; Ouyang et al., 2008; Vinkenborg Jan et al., 2007). In addition, since the construction of FRET sensors often necessitates optimal structure to enhance FRET efficiency between the donor-acceptor pair, dimension and topology are taken into an account (Fritz et al., 2013). In other aspect, as a number of target proteins require a free N or C terminus motifs for lipid or other types of posttranslational modification, construction of FRET-based biosensors should maintain the functional domains of target molecules (Kiyokawa et al., 2011; Pertz et al., 2006). FRET sensors are generally classified into two types, intermolecular and intramolecular (Figs. 1A and 1B). Intermolecular design often performs better FRET efficiency since the position of two interacting proteins of interest are physically isolated in their basal state, which enables substantial ratio change between on and off state of FRET. Despite high signal-to-noise of intermolecular FRET, intramolecular type have become more adopted as they provide experimental convenience such as the expression of an equal amount of interacting molecules that allowing reliable analysis of ratiometric images, easy loading into the cellular environment and the generation of viral plasmid. In addition, because the exogenously introduced molecules often perturb intracellular signaling by undesired interaction with endogenous molecules, excessive intermolecular binding pairs are suggested to be minimal (Welch et al., 2011). 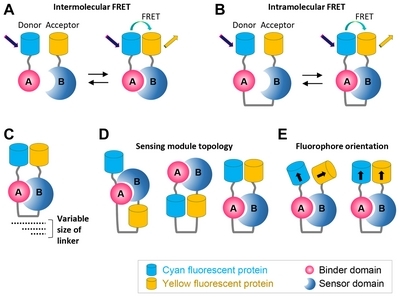 In order to generate, intramolecular FRET sensors, a pair of fluorescent proteins have been suggested including a pair of BFP-GFP (blue-green) (Miyawaki et al., 1997), CFP-YFP (cyan-yellow) (Nguyen and Daugherty, 2005), OFP-RFP (orange-red) (Ouyang et al., 2010) and occasionally GFP-RFP (green-red) (Lam et al., 2012). In the first generation of FRET probes, a BFP-GFP pair was used as the donor and acceptor. However, they were later replaced with CFP and YFP since use of near ultraviolet light for the BFP excitation could potentially cause phototoxicity to the cells. Likewise cyan-yellow fluorescent proteins have been mostly exploited due to their optimal FRET efficiency (Nguyen and Daugherty, 2005; Ouyang et al., 2008; Vinkenborg Jan et al., 2007). This cyan and yellow fluorescent proteins were then increasingly developed to optimize the FRET efficiency. For example, both brightness and quantum yield are enormously enhanced that would directly affect dynamic range of sensors with high resolution in space and time (Day et al., 2008; Goedhart et al., 2010). Among many ways to improve performance of FRET biosensors, several strategies for the design of intermolecular FRET sensors are suggested. Considering the FRET is distance-dependent between the donor and acceptor, Matsuda and colleagues developed an optimized a general backbone of FRET biosensors for kinases and small GTPases (Komatsu et al., 2011). In this technology, a long flexible amino acid linker called EEVEE linker as a general backbone of FRET biosensors were tested in various length and sequence combination (Fig. 1C). In this approach, one can expect reduced basal FRET signal and increased dynamic range. One of other aspects in FRET sensor design is the orientation and topology in the conformational changes of FRET molecules. This key concept is especially important in generating intermolecular FRET biosensors since the structural constraints can be frequently found during the FRET processes consisting of sensing module with compact domain or short peptide. As mentioned earlier, ideally designed probes could impose unique structural challenges due to their dimensions and topology. For these reasons, Olivier and colleagues shuffled variation of the domain topologies of the sensing modules by generically modifying fusion constructs (Fig. 1D). Furthermore, by applying circularly permutation in the fluorescent proteins, various orientation of fused fluorophore were tested to find the best conformation (Fig. 1E). In such efforts, FRET biosensors generated to target RhoA and ERK activities were greatly improved in sensitivity and resolution in space and time (Fritz et al., 2013). Apart from the CFP-YFP FRET pair, the GFP and red fluorescent protein (RFP) pair have been also adopted, especially with two-photon excitation microscopy for the deep tissue imaging of animal models (Harvey et al., 2008b; Yasuda et al., 2006). While the genetically encoded reporters devoted a remarkable contribution to help understand the dynamic nature of molecular activities at a high spatiotemporal resolution, researchers in cell biology have long asked how intracellular signaling pathways respond to the external environment to make their best decisions. This issue in turn arose a methodological question that is how one can directly isolate the function of a gene or a protein in accordance with specific cellular output, especially when tracking back underlying mechanism of how the signaling processes are altered abnormally. Intracellular signaling pathways are function as circuits in that cells respond to their environment by transducing external stimuli such as growth factors and hormones, leading to relevant internal signaling processing to make proper decisions. More importantly, such phenomena accompanies intricate cellular responses in that distinct cellular outputs that are induced by different growth factors that utilize the mutual signaling pathways (Santos et al., 2007). Unquestionably, the conventional methods including biochemical perturbations and genetic modification have continued to elucidate underlying mechanisms of signaling proteins that are responsible for specific cellular functions (Banaszynski et al., 2008; Doupé and Perrimon, 2014; Stockwell, 2004; Turgeon and Meloche, 2009). However, investigating protein functions in the dynamic nature of signal mechanisms have also been lagged mainly due to a lack of precisely controllable tools that access this dynamic information, especially in the living cells. For these reasons, technologies exploiting light-sensitive proteins have been developed and expanded rapidly in various biological applications offering powerful means to overcome these limitations and to achieve the output specificity by directly regulating intracellular signaling transduction in space and time. Since the first discovery of photoactivatable and light-sensitive proteins including Rhodopsin (Boyden et al., 2005), light, oxygen, and voltage (LOV) domain (Christie et al., 1999; Harper et al., 2003), Cryptochrome 2 (CRY2) (Kennedy et al., 2010), Phytochrom B (PhyB) (Khanna et al., 2004), UV-resistance locus 8 (UVR8) (Crefcoeur et al., 2013), and Dronpa (Habuchi et al., 2005), these light sensitive modules have been intensively engineered to become controllable to regulate signal transduction under specific wavelengths. Depending on the photoreceptor, a number of signaling nodes have been spatiotemporally regulated by the combinatorial functions of light-sensitive and secondary signaling domains, ranging from microbial ion pumps, receptor-tyrosine kinases, G-protein-coupled receptors and lipid binding domains (Bugaj et al., 2013; Chow et al., 2010; Han and Boyden, 2007; Levskaya et al., 2009; Strickland et al., 2010; Wu et al., 2009; Zhang et al., 2006; Zhou et al., 2012). Among many of available light-responsive interacting modules, cryptochrome 2 (CRY2PHR), the members of a module pair, is based on plant photoreceptors derived from Arabidopsis thaliana. This protein undergoes a conformational change and promotes binding with CIB1 (Zhang et al., 2014) or homo-oligomerization (Bugaj et al., 2013; Park et al., 2017; Taslimi et al., 2014) upon blue light illumination (Fig. 2A). Because of its fast responsiveness with subsecond time resolution, subcellular spatial resolution, and no need for exogenous cofactors, CRY2PHR has been adopted for genetically engineered optogenetic modules for use in studies of intracellular regulatory proteins, together named optogenetic actuators. CRY2PHR is genetically encodable with various intracellular proteins that allow control of protein-protein interactions in mammalian cells in a light-dependent manner, thereby suitable for application to receptor systems that are activated by an interaction between receptor monomers, such as receptor tyrosine kinases (RTKs). RTK activation is typically induced by ligand-mediated receptor dimerization, which in turn leads to autophosphorylation of tyrosine kinase domains and recruitment of downstream signaling molecules. By applying the schematic, directly linked Trk receptors to photolyase homology region (PHR) of CRY2 were efficiently activated driven by the homo-interaction of PHR in response to light (Chang et al., 2014) (Fig. 2B). This CRY2PHR-based optogenetic actuator, optoTrk, enables rapid and subcellular activation of Trk A, B and C in a reversible fashion. Moreover, local control of optoTrkB allows to reveal spatiotemporal function of TrkB in the neurite outgrowth process with unique observation of retrograde axonal transport of internalized TrkB in young hippocampal neurons. Notably, a transient or a persistent tune of light illumination can manipulates modes of target activation that may help elucidate underlying mechanisms of variable cellular responses to the same upstream input. Similar to the result of local neurite outgrowth by the persistent induction of optoTrkB, asymmetric polarity was established in fibroblast using light-inducible FGFR1 activation system (Kim et al., 2014). Chemotaxis has long been a reliable system to study local function of molecules that are responsible for inducing cell polarization. However, such chemically induced systems could not dissect the function of a specific receptor within a bulk of receptor variants involved the similar output process. OptoFGFR1 consisting of CRY2PHR, the cytoplasmic region of human FGFR1 and a myristoylation signal peptide enables light-dependent homointeraction of CRY2PHR that brings FGFR1s into close proximity, and thereby leading to activation of the cytoplasmic domain of FGFR1 (Fig. 2C). In this technology, the successful induction of cell polarity induction suggests the possibility of substitution of the microfluidics-based chemotaxis to phototaxis model in which directed cell migration can be induced through local and repeated blue light delivery. The light-driven phototaxis model in cell migration study over the conventional chemotaxis strategy allows for high reversibility and control of stimulation level. Also of note, despite the precise inhibition of target proteins promises effective means to dissect complex signaling networks, current experimental strategies for downregulating target proteins are restricted to genetic mutation and small molecule-based inhibitors that often cause lethality and off-target effects. Moreover, irreversibility of these techniques excludes much of temporal and subcellular information in the case of region or tissue specific studies. In order to address such issues, optogenetic tools have recently offered a versatile strategy that inhibits protein function by reversibly sequestering targets into large, optically assembled protein architectures in living cells. An optogenetic tool named, light-activated reversible inhibition by assembled trap (LARIAT), consists of a multimeric protein (MP) and a light-mediated heterodimerizer that traps target proteins under light stimulation by interconnections among MPs that form higher-order protein complexes, or ‘clusters’ (Fig. 2D) (Lee et al., 2014). As LARIAT is light-dependent, it offers a promising resource for controlling signaling cascades with rapid responses, reversibility and high spatiotemporal resolution. Using LARIAT, the inhibition of diverse proteins dramatically modulate cytoskeleton, lipid signaling and cell cycle. Importantly, use of single-domain antibodies greatly extends the method to target proteins containing specific epitopes that are widely accessible. In addition, the principle of LARIAT system has recently been expanded to generate IM-LARIAT in order to spatiotemporally regulate dynamic movement of intracellular membrane organelles (Fig. 2E) (Nguyen et al., 2016). Along with other methods, IM-LARIAT provides a new method to spatiotemporally inhibit membrane functions using diverse Rab GTPases with a rapid recovery and less side effects. Given that, light-induced local aggregation of Rab5-targeted endosomal membrane significantly deduced the rates of protruding growth cone of rat hippocampal neurons (Nguyen et al., 2016). Using homo-oligomeric properties of CRY2, CRY2-mediated oligomerization of STIM1 (optoSTIM1) activated endogenous Ca2+ release-activated Ca2+ (CRAC) channels, modulating upregulation of Ca2+ levels in zebrafish embryos and in human embryonic stem cells (Kyung et al., 2015). Similar to other CRY2-based optogenetic actuators, optoSTIM1 enables fine control of reversible and subcellular Ca2+ concentration which exemplifies the synergistic application of optogenetic control and simultaneous visualization of red-shifted reporters (Figs. 3A and 3C). Notably, photo-triggered induction of optoSTIM1 in mouse hippocampal neurons selectively reinforced contextual memory formation in vivo. This result suggests that the brain region and cell-type specific spatiotemporal control of Ca2+ modulation is an attractable tool that would facilitate various application by neuroscientists. Despite impressive achievements enabled by various optogenetic actuators, biological functions manipulated by the light-stimulation necessitates appropriate readouts that permits spatiotemporal target visualization. In other words, direct visualization and light control of relevant cellular process has long been challenging, owing to the spectral overlap of available genetically encoded probes. Various optogenetic tools typically require spectrally compatible imaging probes since they respond to specific wavelength. Crypto-chrome-2 (CRY2PHR), light-oxygen-voltage (LOV) and channelrhodopsins are the examples, all of which are activated with blue-green light. In consideration of dynamic visualization reporters, FRET biosensors based on cyan fluorescent protein (CFP) and yellow fluorescent protein (YFP) of the green fluorescent protein (GFP)-like family have long been engineered and adopted in the fields of cell biology. Despite impressive array of available fluorescence hues from the engineered variant of Aequorea jelly fish GFP (Yang, 1996) and Discosoma coral RFP (Shaner, 2004), FRET-based dynamic biosensors still rely on a relatively limited number of preferred fluorescent protein pairs (Miyawaki 1997). This can be explained by two important issues, first, cyan-yellow pair has become the most popular fluorophores since they provide the optimal FRET efficiency in the process of energy transfer between donor and acceptor which promises the highest dynamic range when visualized in live cells. Second, other available hues for a FRET acceptor and donor (e.g. RFP variants and near infrared (NIR) fluorescent proteins) often require particularized imaging methods that are relatively not generalizable, otherwise yield less FRET efficiency (Demeautis et al., 2017; Grant et al., 2008). Nevertheless, in order to study spatiotemporal target activity under simultaneous control of blue light-activation system, red-shifted FRET or other types of readout are highly essential. Therefore, various strategic conversion from FRET to new type of biosensors have been established for the last decade. The new trends in the generation of biosensors have been commonly subcategorized as non-FRET single FP-based reporters that utilize fluorescent proteins that is engineered to have a chromophore that is spectrally sensitive to its environment or to a protein conformational change that is caused by the changes in biochemical status of the analytes (Alford et al., 2013). Among various single FP-based visualization techniques, the widely adopted reporters that exploit red-shifted fluorescent proteins are R-GECO, BiFC and ddRFP. R-GECO was originally engineered as green version (G-CaMP) that detects intracellular Ca2+ changes sensing by complementation of per-mutated chromophore (Siegel and Isacoff, 1997, Baird 1999, Nagai 2001, Nakai 2001). The molecular sensing elements for Ca2+ detection are the CaM domain and the M13 peptide that are fused to the N- and C-termini of circularly permutated GFP (cpGFP). The conformational change driven by the Ca2+ binding promotes tight interaction of CaM and M13 that blocks the free access of solvent to the chromophore and restores fluorescence. Since R-GECO have been the most extensively used and allowed for compatible use of optogenetic modules, a number of Ca2+ signaling events were both manipulated and visualized in a precise space and time manner (Nagel et al., 2003; Ohkura et al., 2012; Schröder-Lang et al., 2006; Zhao et al., 2011). BiFC gains fluorescent signal through the complementation of two non-fluorescent fragments that are split in the basal state. BiFCs are similar to R-GECO since they detects protein interactions. However practical use of BiFCs are restricted to visualize dynamic signaling events due to the slow kinetics and irreversibility. Nevertheless, high signal-to-noise of BiFC has offered a robust assay in various high-throughput strategies to identify proteins interactions (Ding et al., 2006; Jach et al., 2006; Kojima et al., 2011). Notably, the BiFC color palette has increasingly expanded and generated optogenetic reporters with both red (Fan et al., 2008; Jach et al., 2006) and far-red (Chu et al., 2009) hues that are now split and available as complementation-based optogenetic reporters. A recently reported strategy named ddFPs also share conceptual similarities with BiFC (Alford et al., 2012a; 2012b). ddFPs combine two quenched fluorescent protein-derived monomers: copy A and B. The copy A chromophore produces bright fluorescence when heterodimerized with copy B. Copy A can be spectrally diversified into green (GA) or red (RA) hue by mutations on multiple amino acids, copy B variants can bind to both GA and RA with similar or distinct affinities (Ding et al., 2015), implying possible utilization for an optogenetic readout. Advances that make ddFPs different from BiFCs is their relatively rapid kinetics and reversibility. As suggested from the studies (Alford et al., 2012a; Ding et al., 2015), ddFPs-based single colored biosensors efficiently visualized dynamic changes in caspase activity and Ca2+ level in live cells. Importantly, ddFPs could take less effort on the optimization process in developing interaction based biosensors. This, in turn, may further suggest the potential generalizability of ddFPs for various applications. In this review, we have discussed the overall stream of bioimaging technologies that have suggested solutions in order to visualize and control particular signaling events in dynamic nature of cells. Accumulating evidences suggest that analyzed responses of cell population would bring different results from single-cell studies owing to the intrinsic noise produced by heterogeneous single cell behaviors (Regot et al., 2014). Similarly, as signal transductions in cell biology often encode complex cellular responses upon the slight changes in their environment, dynamic single-cell readouts that target multiple signaling events, or synthetic stimulus under tight control of spatiotemporal light illumination may hold the key to dissect a specific reaction over the number of molecular events. Expansion of a spectral palette for fluorescent proteins and their engineered biosensors have addressed these issues by directly monitoring biochemical changes of molecular status. Several systematic strategies in developing FP-based biosensors commonly pursue the mutual goals to enhance signal-to-noise, high time resolution and establishment of a generalized platform. Like red-shifted reporters with optogenetic actuators have dramatically changed approaches in cell biology, continuous generation of visualizing tools would further yield specialized biological readouts in their particular purposes such as super resolution-based single molecule imaging, tissue level imaging of awake animal models and single cell multiplexed visualization. Optogenetic applications to cell biology have replenished our experimental approaches that were previously challenging and may still leave a plenty of space for future studies. By spatially inducing the local activities of target molecules, one can distinguish the localized functions of molecules from micro to macro resolution in cells and tissues of animals. Furthermore, temporally dissected activities could reveal underlying mechanism of various cellular outputs by versatile kinetic modulation of light stimulation. Importantly, physicochemical limit of bioluminescence proteins and light-sensitive receptors will rely greatly on parallel advancements of optical devices and systematic analysis that could enhance acquisition of high resolution and light delivery of currently available tools. In vivo applications would mainly focus on the light delivery system that efficiently penetrate thick tissues of animals. This would involve increasing the sensitivity of both genetically encoded optogenetic actuators and reporters. Furthermore, surgical approaches that allow effective light delivery to the desired regions of tissue would be useful. Additionally, the continuous development of red-shifted optogenetic actuators and reporters will accelerate the effective light penetration through the thick tissues and image acquisition for multi-photon microscopy. Together, these optogenetic actuators and reporters should, in principle, be applicable to a wide range of biological researches. Fig. 1. Schematics for the design of FRET-based dynamic biosensors as in (A) an intermolecular type or (B) an intramolecular type. (C) Strategy of linker design by varying size and sequences of amino acids. (D) Selection of sensing module topology for optimal efficiency of FRET. (E) Modification of fluorophore orientation to ensure sufficient energy transfer between a fluorescence pair of donor and acceptor. Fig. 2. (A) Schematic depicts modes of CRY2 interaction induced by blue light stimulation. (B, C) Schematic of Opto-TrkB and OptoFGFR1 activation by light-inducible CRY2 homo-interaction upon blue light stimulation. 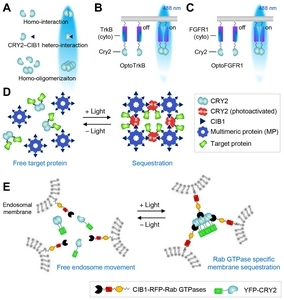 (D) Sequestration of CRY2-conjugated proteins by light-inducible trapping in clusters (LARIAT). (E) Schematic of intracellular membrane aggregation (IM-LARIAT) triggered by the light-induced binding of CRY2- and CIB1-Rab. Fig. 3. (A) Schematic of optoSTIM1activation by blue light-inducible PHR homo-oligomerization. 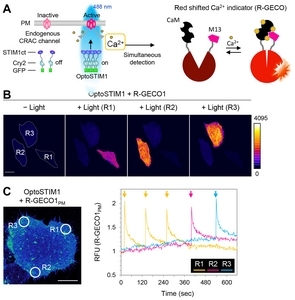 A red-shifted calcium reporter, R-GECO can be simultaneously visualized under the precise control of spatiotemporal OptoSTIM1 activation. (B) Pseudocolored fluorescence images of a red-shifted genetically encoded calcium indicator (R-GECO1). Three HeLa cells (R1, R2, and R3) co-expressing OptoSTIM1 and R-GECO1 were sequentially stimulated with blue light at different time points. White dotted lines indicate cell boundaries. Scale bar, 20 μm. (C) Pseudocolor image of R-GECO1PM fluorescence in a HeLa cell co-expressing OptoSTIM1. White circles designate three subcellular regions (R1, R2, and R3) sequentially stimulated with blue light. Scale bar, 20 μm. Graph represents changes in fold-changes of R-GECO1PM according to time at three subcellular regions. Red, green and blue arrows indicate time points of light stimulation in R1, R2 and R3, respectively. Ai, H.W., Henderson, J.N., Remington, S.J., and Campbell, R.E. (2006). Directed evolution of a monomeric, bright and photostable version of Clavularia cyan fluorescent protein: structural characterization and applications in fluorescence imaging. Biochem J. 400, 531-540. Alford, S.C., Abdelfattah, A.S., Ding, Y., and Campbell, R.E. (2012a). A fluorogenic red fluorescent protein heterodimer. Chem Biol. 19, 353-360. Alford, S.C., Ding, Y., Simmen, T., and Campbell, R.E. (2012b). Dimerization-dependent green and yellow fluorescent proteins. ACS Synthetic Biol. 1, 569-575. Alford, S.C., Wu, J., Zhao, Y., Campbell, R.E., and Knöpfel, T. (2012). Optogenetic reporters. Biol Cell. 105, 14-29. Aoki, K., Nakamura, T., and Matsuda, M. (2004). Spatiotemporal regulation of Rac1 and Cdc42 activity during nerve growth factor-induced neurite outgrowth in PC12 cells. J Biol Chem. 279, 713-719. Baird, G.S., Zacharias, D.A., and Tsien, R.Y. (1999). Circular permutation and receptor insertion within green fluorescent proteins. Proc Natl Acad Sci USA. 96, 11241-11246. Banaszynski, L.A., Sellmyer, M.A., Contag, C.H., Wandless, T.J., and Thorne, S.H. (2008). Chemical control of protein stability and function in living mice. Nat Med. 14, 1123-1127. Berndt, A., Schoenenberger, P., Mattis, J., Tye, K.M., Deisseroth, K., Hegemann, P., and Oertner, T.G. (2011). High-efficiency channelrhodopsins for fast neuronal stimulation at low light levels. Proc Natl Acad Sci USA. 108, 7595-7600. Boyden, E.S., Zhang, F., Bamberg, E., Nagel, G., and Deisseroth, K. (2005). Millisecond-timescale, genetically targeted optical control of neural activity. Nat Neurosci. 8, 1263-1268. Bugaj, L.J., Choksi, A.T., Mesuda, C.K., Kane, R.S., and Schaffer, D.V. (2013). Optogenetic protein clustering and signaling activation in mammalian cells. Nat Methods. 10, 249-252. Campbell, R.E., Tour, O., Palmer, A.E., Steinbach, P.A., Baird, G.S., Zacharias, D.A., and Tsien, R.Y. (2002). A monomeric red fluorescent protein. Proc Natl Acad Sci USA. 99, 7877. Chang, K.Y., Woo, D., Jung, H., Lee, S., Kim, S., Won, J., Kyung, T., Park, H., Kim, N., and Yang, H.W. (2014). Light-inducible receptor tyrosine kinases that regulate neurotrophin signalling. Nat Commun. 5, 4057. Chow, B.Y., Han, X., Dobry, A.S., Qian, X., Chuong, A.S., Li, M., Henninger, M.A., Belfort, G.M., Lin, Y., and Monahan, P.E. (2010). High-performance genetically targetable optical neural silencing by light-driven proton pumps. Nature. 463, 98-102. Christie, J.M., Salomon, M., Nozue, K., Wada, M., and Briggs, W.R. (1999). LOV (light, oxygen, or voltage) domains of the blue-light photoreceptor phototropin (nph1): Binding sites for the chromophore flavin mononucleotide. Proc Natl Acad Sci USA. 96, 8779-8783. Chu, J., Zhang, Z., Zheng, Y., Yang, J., Qin, L., Lu, J., Huang, Z.-L., Zeng, S., and Luo, Q. (2009). A novel far-red bimolecular fluorescence complementation system that allows for efficient visualization of protein interactions under physiological conditions. Biosens Bioelectron. 25, 234-239. Crefcoeur, R.P., Yin, R., Ulm, R., and Halazonetis, T.D. (2013). Ultraviolet-B-mediated induction of protein–protein interactions in mammalian cells. Nat Commun. 4, 1779. Davidson, M.W., and Campbell, R.E. (2009). Engineered fluorescent proteins: innovations and applications. Nat Methods. 6, 713-717. Day, R.N., Booker, C.F., and Periasamy, A. (2008). Characterization of an improved donor fluorescent protein for Förster resonance energy transfer microscopy (SPIE). J Biomed Optics. 13, 031203. Demeautis, C., Sipieter, F., Roul, J., Chapuis, C., Padilla-Parra, S., Riquet, F.B., and Tramier, M. (2017). Multiplexing PKA and ERK1&2 kinases FRET biosensors in living cells using single excitation wavelength dual colour FLIM. Sci Rep. 7, 41026. Dimitrov, D., He, Y., Mutoh, H., Baker, B.J., Cohen, L., Akemann, W., and Knöpfel, T. (2007). Engineering and characterization of an enhanced fluorescent protein voltage sensor. PloS One. 2, e440. Ding, Z., Liang, J., Lu, Y., Yu, Q., Songyang, Z., Lin, S.-Y., and Mills, G.B. (2006). A retrovirus-based protein complementation assay screen reveals functional AKT1-binding partners. Proc Natl Acad Sci USA. 103, 15014-15019. Ding, Y., Li, J., Enterina, J.R., Shen, Y., Zhang, I., Tewson, P.H., Mo, G.C., Zhang, J., Quinn, A.M., and Hughes, T.E. (2015). Ratiometric biosensors based on dimerization-dependent fluorescent protein exchange. Nat Methods. 12, 195-198. Doupé, D.P., and Perrimon, N. (2014). Visualizing and manipulating temporal signaling dynamics with fluorescence–based tools. Sci Signal. 7, re1. Fan, J.Y., Cui, Z.Q., Wei, H.P., Zhang, Z.-P., Zhou, Y.F., Wang, Y.P., and Zhang, X.E. (2008). Split mCherry as a new red bimolecular fluorescence complementation system for visualizing protein–protein interactions in living cells. Biochem Biophys Res Commun. 367, 47-53. Fosbrink, M., Aye-Han, N.-N., Cheong, R., Levchenko, A., and Zhang, J. (2010). Visualization of JNK activity dynamics with a genetically encoded fluorescent biosensor. Proc Natl Acad Sci USA. 107, 5459-5464. Fritz, R.D., Letzelter, M., Reimann, A., Martin, K., Fusco, L., Ritsma, L., Ponsioen, B., Fluri, E., Schulte-Merker, S., and Rheenen, J.V. (2013). A versatile toolkit to produce sensitive FRET biosensors to visualize signaling in time and space. Sci Signal. 6, 2-13. Goedhart, J., van Weeren, L., Hink, M.A., Vischer, N.O.E., Jalink, K., and Gadella, T.W.J. (2010). Bright cyan fluorescent protein variants identified by fluorescence lifetime screening. Nat Methods. 7, 137-139. Gradinaru, V., Thompson, K.R., Zhang, F., Mogri, M., Kay, K., Schneider, M.B., and Deisseroth, K. (2007). Targeting and readout strategies for fast optical neural control in vitro and in vivo. J Neurosci. 27, 14231-14238. Grant, D.M., Zhang, W., McGhee, E.J., Bunney, T.D., Talbot, C.B., Kumar, S., Munro, I., Dunsby, C., Neil, M.A.A., and Katan, M. (2008). Multiplexed FRET to image multiple signaling events in live cells. Biophys J. 95, L69-L71. Habuchi, S., Ando, R., Dedecker, P., Verheijen, W., Mizuno, H., Miyawaki, A., and Hofkens, J. (2005). Reversible single-molecule photoswitching in the GFP-like fluorescent protein Dronpa. Proc Natl Acad Sci USA. 102, 9511-9516. Han, X., and Boyden, E.S. (2007). Multiple-color optical activation, silencing, and desynchronization of neural activity, with single-spike temporal resolution. PloS One. 2, e299. Harper, S.M., Neil, L.C., and Gardner, K.H. (2003). Structural basis of a phototropin light switch. Science. 301, 1541. Harvey, C.D., Ehrhardt, A.G., Cellurale, C., Zhong, H., Yasuda, R., Davis, R.J., and Svoboda, K. (2008a). A genetically encoded fluorescent sensor of ERK activity. Proc Natl Acad Sci USA. 105, 19264-19269. Harvey, C.D., Yasuda, R., Zhong, H., and Svoboda, K. (2008b). The spread of Ras activity triggered by activation of a single dendritic spine. Science. 321, 136-140. Heim, R., and Tsien, R.Y. (1996). Engineering green fluorescent protein for improved brightness, longer wavelengths and fluorescence resonance energy transfer. Curr Biol. 6, 178-182. Heim, R., Cubitt, A.B., and Tsien, R.Y. (1995). Improved green fluorescence. Nature. 373, 663. Ibraheem, A., and Campbell, R.E. (2010). Designs and applications of fluorescent protein-based biosensors. Curr Opin Chem Biol. 14, 30-36. Ishizuka, T., Kakuda, M., Araki, R., and Yawo, H. (2006). Kinetic evaluation of photosensitivity in genetically engineered neurons expressing green algae light-gated channels. Neurosci Res. 54, 85-94. Jach, G., Pesch, M., Richter, K., Frings, S., and Uhrig, J.F. (2006). An improved mRFP1 adds red to bimolecular fluorescence complementation. Nat Methods. 3, 597-600. Kennedy, M.J., Hughes, R.M., Peteya, L.A., Schwartz, J.W., Ehlers, M.D., and Tucker, C.L. (2010). Rapid blue-light-mediated induction of protein interactions in living cells. Nat Method. 7, 973-975. Kerppola, T.K. (2008). Bimolecular fluorescence complementation (BiFC) analysis as a probe of protein interactions in living cells. Ann Rev Biophys. 37, 465-487. Khanna, R., Huq, E., Kikis, E.A., Al-Sady, B., Lanzatella, C., and Quail, P.H. (2004). A novel molecular recognition motif necessary for targeting photoactivated phytochrome signaling to specific basic Helix-Loop-Helix transcription factors. Plant Cell. 16, 3033-3044. Kim, N., Kim, J.M., Lee, M., Kim, C.Y., Chang, K.Y., and Heo, W.D. (2014). Spatiotemporal control of fibroblast growth factor receptor signals by blue light. Chem Biol. 21, 903-912. Kiyokawa, E., Aoki, K., Nakamura, T., and Matsuda, M. (2011). Spatiotemporal regulation of small GTPases as revealed by probes based on the principle of Forster Resonance Energy Transfer (FRET): Implications for signaling and pharmacology. Annu Rev Pharmacol Toxicol. 51, 337-358. Kojima, T., Karasawa, S., Miyawaki, A., Tsumuraya, T., and Fujii, I. (2011). Novel screening system for protein–protein interactions by bimolecular fluorescence complementation in Saccharomyces cerevisiae. J Biosci Bioeng. 111, 397-401. Komatsu, N., Aoki, K., Yamada, M., Yukinaga, H., Fujita, Y., Kamioka, Y., and Matsuda, M. (2011). Development of an optimized backbone of FRET biosensors for kinases and GTPases. Mol Biol Cell. 22, 4647-4656. Kyung, T., Lee, S., Kim, J.E., Cho, T., Park, H., Jeong, Y.-M., Kim, D., Shin, A., Kim, S., and Baek, J. (2015). Optogenetic control of endogenous Ca2+ channels in vivo. NatBiotechnol. 33, 1092-1096. Lam, A.J., St-Pierre, F., Gong, Y., Marshall, J.D., Cranfill, P.J., Baird, M.A., McKeown, M.R., Wiedenmann, J., Davidson, M.W., and Schnitzer, M.J. (2012). Improving FRET dynamic range with bright green and red fluorescent proteins. Nat Methods. 9, 1005-1012. Lee, S., Park, H., Kyung, T., Kim, N.Y., Kim, S., Kim, J., and Heo, W.D. (2014). Reversible protein inactivation by optogenetic trapping in cells. Nat Methods. 11, 633-636. Levskaya, A., Weiner, O.D., Lim, W.A., and Voigt, C.A. (2009). Spatiotemporal control of cell signalling using a light-switchable protein interaction. Nature. 461, 997-1001. Li, X., Gutierrez, D.V., Hanson, M.G., Han, J., Mark, M.D., Chiel, H., Hegemann, P., Landmesser, L.T., and Herlitze, S. (2005). Fast noninvasive activation and inhibition of neural and network activity by vertebrate rhodopsin and green algae channelrhodopsin. Proc Natl Acad Sci USA. 102, 17816-17821. Miyawaki, A., Llopis, J., Heim, R., McCaffery, J.M., Adams, J.A., Ikura, M., and Tsien, R.Y. (1997). Fluorescent indicators for Ca2+ based on green fluorescent proteins and calmodulin. Nature. 388, 882-887. Nagel, G., Szellas, T., Huhn, W., Kateriya, S., Adeishvili, N., Berthold, P., Ollig, D., Hegemann, P., and Bamberg, E. (2003). Channelrhodopsin-2, a directly light-gated cation-selective membrane channel. Proc Natl Acad Sci USA. 100, 13940-13945. Nakai, J., Ohkura, M., and Imoto, K. (2001). A high signal-to-noise Ca2+ probe composed of a single green fluorescent protein. Nat Biotechnol. 19, 137-141. Nagai, T., Sawano, A., Park, E.S., and Miyawaki, A. (2001). Circularly permuted green fluorescent proteins engineered to sense Ca2+. Proc Natl Acad Sci USA. 98, 3197-3202. Nguyen, A.W., and Daugherty, P.S. (2005). Evolutionary optimization of fluorescent proteins for intracellular FRET. Nat Biotechnol. 23, 355-360. Nguyen, M.K., Kim, C.Y., Kim, J.M., Park, B.O., Lee, S., Park, H., and Heo, W.D. (2016). Optogenetic oligomerization of Rab GTPases regulates intracellular membrane trafficking. Nat Chem Biol. 12, 431-436. Nishioka, T., Frohman, M.A., Matsuda, M., and Kiyokawa, E. (2010). Heterogeneity of phosphatidic acid levels and distribution at the plasma membrane in living cells as visualized by a Foster resonance energy transfer (FRET) biosensor. J Biol Chem. 285, 35979-35987. Ohkura, M., Sasaki, T., Kobayashi, C., Ikegaya, Y., and Nakai, J. (2012). An improved genetically encoded red fluorescent Ca2+ indicator for detecting optically evoked action potentials. PloS one. 7, e39933. Ouyang, M., Sun, J., Chien, S., and Wang, Y. (2008). Determination of hierarchical relationship of Src and Rac at subcellular locations with FRET biosensors. Proc Natl Acad Sci USA. 105, 14353-14358. Ouyang, M., Huang, H., Shaner, N.C., Remacle, A.G., Shiryaev, S.A., Strongin, A.Y., Tsien, R.Y., and Wang, Y. (2010). Simultaneous visualization of protumorigenic Src and MT1-MMP activities with fluorescence resonance energy transfer. Cancer Res. 70, 2204-2212. Park, H., Kim, N.Y., Lee, S., Kim, N., Kim, J., and Heo, W.D. (2017). Optogenetic protein clustering through fluorescent protein tagging and extension of CRY2. Nat Commun. 8, 30. Pertz, O., Hodgson, L., Klemke, R.L., and Hahn, K.M. (2006). Spatiotemporal dynamics of RhoA activity in migrating cells. Nature. 440, 1069-1072. Regot, S., Hughey Jacob, J., Bajar Bryce, T., Carrasco, S., and Covert Markus, W. (2014). High-sensitivity measurements of multiple kinase activities in live single cells. Cell. 157, 1724-1734. Santos, S.D.M., Verveer, P.J., and Bastiaens, P.I.H. (2007). Growth factor-induced MAPK network topology shapes Erk response determining PC-12 cell fate. Nat Cell Biol. 9, 324-330. Schröder-Lang, S., Schwärzel, M., Seifert, R., Strünker, T., Kateriya, S., Looser, J., Watanabe, M., Kaupp, U.B., Hegemann, P., and Nagel, G. (2006). Fast manipulation of cellular cAMP level by light in vivo. Nat Methods. 4, 39-42. Shaner, N.C., Campbell, R.E., Steinbach, P.A., Giepmans, B.N.G., Palmer, A.E., and Tsien, R.Y. (2004). Improved monomeric red, orange and yellow fluorescent proteins derived from Discosoma sp. red fluorescent protein. Nat Biotechnol. 22, 1567-1572. Shcherbakova, D.M., and Verkhusha, V.V. (2013). Near-infrared fluorescent proteins for multicolor in vivo imaging. Nat Methods. 10, 751-754. Shcherbo, D., Merzlyak, E.M., Chepurnykh, T.V., Fradkov, A.F., Ermakova, G.V., Solovieva, E.A., Lukyanov, K.A., Bogdanova, E.A., Zaraisky, A.G., and Lukyanov, S. (2007). Bright far-red fluorescent protein for whole-body imaging. Nat Methods. 4, 741-746. Siegel, M.S., and Isacoff, E.Y. (1997). A genetically encoded optical probe of membrane voltage. Neuron. 19, 735-741. Shimomura, O., Johnson Frank, H., and Saiga, Y. (1962). Extraction, purification and properties of aequorin, a bioluminescent protein from the luminous hydromedusan, aequorea. J Cell Comp Physiol. 59, 223-239. Stockwell, B.R. (2004). Exploring biology with small organic molecules. Nature. 432, 846-854. Strickland, D., Yao, X., Gawlak, G., Rosen, M.K., Gardner, K.H., and Sosnick, T.R. (2010). Rationally improving LOV domain–based photoswitches. Nat Methods. 7, 623-626. Taslimi, A., Vrana, J.D., Chen, D., Borinskaya, S., Mayer, B.J., Kennedy, M.J., and Tucker, C.L. (2014). An optimized optogenetic clustering tool for probing protein interaction and function. Nat Commun. 5, 4925. Tomosugi, W., Matsuda, T., Tani, T., Nemoto, T., Kotera, I., Saito, K., Horikawa, K., and Nagai, T. (2009). An ultramarine fluorescent protein with increased photostability and pH insensitivity. Nat Methods. 6, 351-353. Turgeon, B., and Meloche, S. (2009). Interpreting neonatal lethal phenotypes in mouse mutants: insights into gene function and human diseases. Physiol Rev. 89, 1-26. Vinkenborg Jan, L., Evers Toon, H., Reulen Sanne, W.A., Meijer, E.W., and Merkx, M. (2007). Enhanced sensitivity of FRET-based protease sensors by redesign of the GFP dimerization interface. ChemBioChem. 8, 1119-1121. Welch, C.M., Elliott, H., Danuser, G., and Hahn, K.M. (2011). Imaging the coordination of multiple signalling activities in living cells. Nat Rev Mol Cell Biol. 12, 749-756. Wu, Y.I., Frey, D., Lungu, O.I., Jaehrig, A., Schlichting, I., Kuhlman, B., and Hahn, K.M. (2009). A genetically encoded photoactivatable Rac controls the motility of living cells. Nature. 461, 104-108. Yasuda, R., Harvey, C.D., Zhong, H., Sobczyk, A., van Aelst, L., and Svoboda, K. (2006). Supersensitive Ras activation in dendrites and spines revealed by two-photon fluorescence lifetime imaging. Nat Neurosci. 9, 283-291. Zhang, K., and Cui, B. (2015). Optogenetic control of intracellular signaling pathways. Trends Biotechnol. 33, 92-100. Zhang, F., Wang, L.-P., Boyden, E.S., and Deisseroth, K. (2006). Channelrhodopsin-2 and optical control of excitable cells. Nat Methods. 3, 785-792. Zhang, K., Duan, L., Ong, Q., Lin, Z., Varman, P.M., Sung, K., and Cui, B. (2014). Light-mediated kinetic control reveals the temporal effect of the Raf/MEK/ERK pathway in PC12 cell neurite outgrowth. PloS one. 9, e92917. Zhao, Y., Araki, S., Wu, J., Teramoto, T., Chang, Y.F., Nakano, M., Abdelfattah, A.S., Fujiwara, M., Ishihara, T., and Nagai, T. (2011). An expanded palette of genetically encoded Ca2+ indicators. Science. 333, 1888-1891. Zhou, X.X., Chung, H.K., Lam, A.J., and Lin, M.Z. (2012). Optical control of protein activity by fluorescent protein domains. Science. 338, 810-814.